CWM4W_feedbackThe pilot Commonwealth mentorship scheme has greatly influenced my life tremendously. My mentor Lisa Pieree is an outstanding person with a portfolio that i really admire. I must say, that i'm grateful to her that i have made it through elegantly, with a little more colour, weight, and resonance. It is with profound gratitude I wish to thank L. Pieree, Angelique Pouponneau and Sandy Mayzell for the sharing for these past few months. Along the way i have learnt, grew, shared and was inspired. This scheme has enlightened me to be clear with my goals. Being an Indigenous Fijian valuing tradition and culture; I have boundaries when to speak, who to speak with and what to speak for. Through the sessions one of the learning is that; there is a time for you to hold your thoughts and a time to express your thoughts. Growing up, i was always disappointed that girls opinions are not considered, even though i'm the eldest. 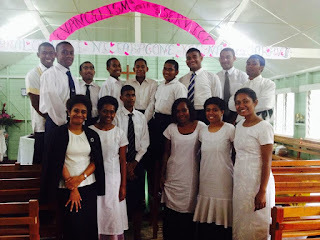 I studied in one of the prominent girls schools in Fiji and we mostly have talks about women. Women in the working space and women rights most importantly. Women in my country are popular in court due to cases of violence against women. Through the session with L.Pieree and S. Mayzell, i have grasped that my right as a woman comes with responsibility. Responsibility is often hidden and as a young woman, i need to be transparent. Responsibility often calls for freedom of expression. "May we not think of freedom as the right to do as we please, But as the opportunity to do what is right." -Peter Marshall. Reading the checklist; the part where it says to list my goals, i was shocked. Coming to my sense that I was not clear with my goals. I had goals but they were thinking goals and not written goals. I could not meet the deadline for goal submission, therefore i emailed Ms Pouponneau for an extension as i had to think it over carefully. i) Who am i as a human being? ii) What is my life worth? iii) Whom do I love? iv) What am i willing to fight for? v) Am I doing the best i can? vi) What am I running away from? vii) Where am I going? These questions assisted me in designing my goals. This scheme has made my heart and soul to work and in the process I have achieved my goals. Women in leadership in Fiji continue to move up the ladder over the years. I had my own story of what I wanted to become and it seems like i have forgotten my grandmothers' stories. They have faced a lot of hardships and difficulties throughout history. The advisory sessions Ms. Mayzell invited me to their teachers program. I gathered alot of inspiring information from there and i'm challenged that as i build on my experience over the years i will also be designing a program that will assist young Fijian women. Looking specifically on implementation for young women at an early age. What have been documented for my goals in my checklist has been accomplished. Some of it are important but it does not necessarily hold prime position in what I have realised during the scheme. Currently being a volunteer at work and in church, I asked myself am I truly making a difference in my community. This question left my mind and heart to work together. So far this year, being a youth leader in church we have achieved our goal. And that is during the Methodist week where we met and cleaned up our church along with the youth members and on Sunday (22/10/2017) the service. We still have upcoming projects and activities such as visiting the widow and the widower our church community. Most importantly i have learnt in the volunteering that i have been doing is that human lives matter.